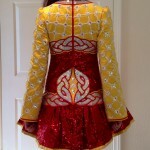 Exquisite and sparkling solo dress made by Sarah Rule of Northern California. 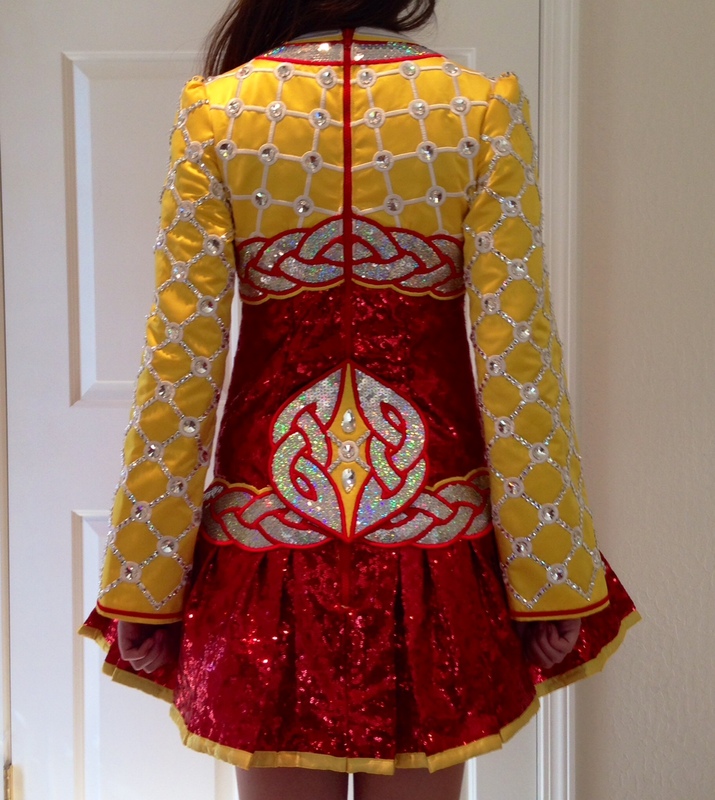 Made for 2013 Oireachtas. 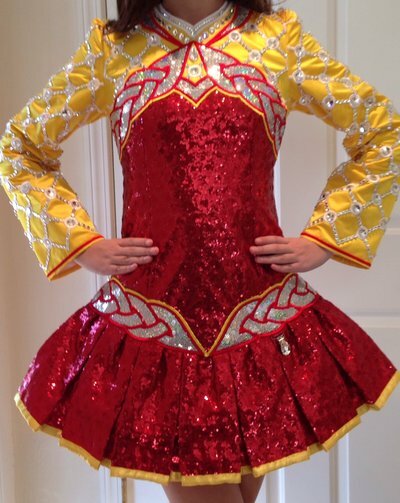 The bodice and skirt are made of cherry red baby sequin material. 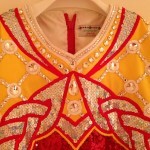 Sleeves and shoulders are yellow twinkle satin. Silver holo-dot sequin material fill in the embroidered accents. The underskirt is hot pink satin, red satin, and yellow tulle. 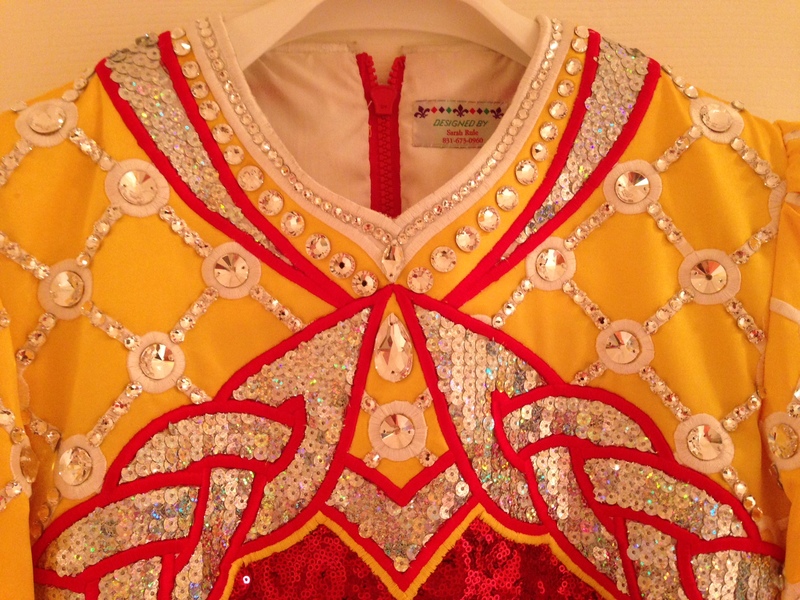 The sleeves, upper bodice, and sash are embellished with lots of Swarovski clear crystals that sparkle on stage. The bodice is lined in soft white cotton for comfort. There is still some let out room. The dress was made with Sarah’s trademark attention to detail: seams are beautifully finished, large crystals are sewn on not glued. The dress is in immaculate condition. There are no visible marks and no odors (always worn with dress shields and camisole). Stored in a smoke-free home. Sale includes custom made large stone crystal tiara, matching kick pants, sash, and card holder. More photos available upon request. Measurements taken with the dress laying flat. Asking Price: $US795. Shipping costs are included for my own country, overseas shipping is extra. Will accept returns and refund the cost of the dress, buyer to pay all shipping costs.